As proposals for City Square appear to be moving forward it seems like the Brisac Gonzalez’s design has been scuppered. This despite no firm majority in favour of redeveloping Union Street Gardens. More news online soon. The £12.5m development is expected to be completed by 2010. The plans have been praised by Architecture and Design Scotland. The new Union Terrace Gardens centre will attract over 200,000 visitors per year to the North-east. The plans were unanimously approved by the council and have received public backing, with thousands of messages of support submitted to Holyrood ahead of the decision. Kate Dean, Council Leader said: “Bringing high quality architecture to Aberdeen is a key part of our vision for city centre redevelopment….What we’re creating is an iconic building for the city”. 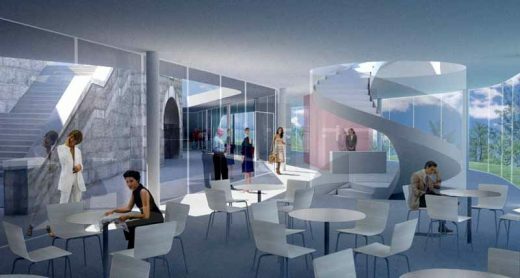 Visual Arts Centre comprising: exhibition spaces, art studios, dance studios, a multi purpose room, television and digital studios, library, office, restaurant and bar. The new building for the Peacock Visual arts will be situated on three stepped terraces within Union Terrace Gardens. This setting coupled with the strict requirement that no building obstruct the view to His Majesty’s theatre from Union Street gives rise to a unique architectural condition in that the building is literally entered from the top down – via the roof that will also serve as an expansive urban space. On the roof we envision a host of different ephemeral activities – market, bookstalls, exhibitions, café. 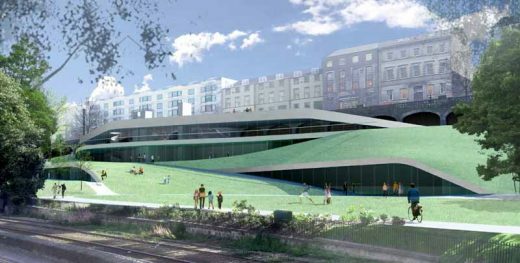 These activities will attract visitors to the gardens and the new building; they will enrich the urban life along Union Terrace and also serve as a living signage of sorts for the Peacock Visual Arts. Peacock Visual Arts is unique in Scotland in its range of facilities (digital imaging, photography, printmaking, video and internet television) and services it offers. It promotes many participatory projects, residencies, exhibitions of contemporary art, learning opportunities and public events each year. The new premises will also contain the council’s arts development, arts education, and Citymoves Dance Space. The latter provides specialist dance classes and workshops. Planning submission by Brisac Gonzalez for Aberdeen Contemporary Arts Centre. The proposed building is to include Peacock Visual Arts, Aberdeen City Council Arts Development & Education departments and CityMoves dance space. The location is Union Terrace Gardens, in the centre of Aberdeen. The Centre for Contemporary Arts has been designed by Brisac Gonzalez Architects, London. Previously Peacock Visual Arts had run an international competition for a new base but this was annulled. 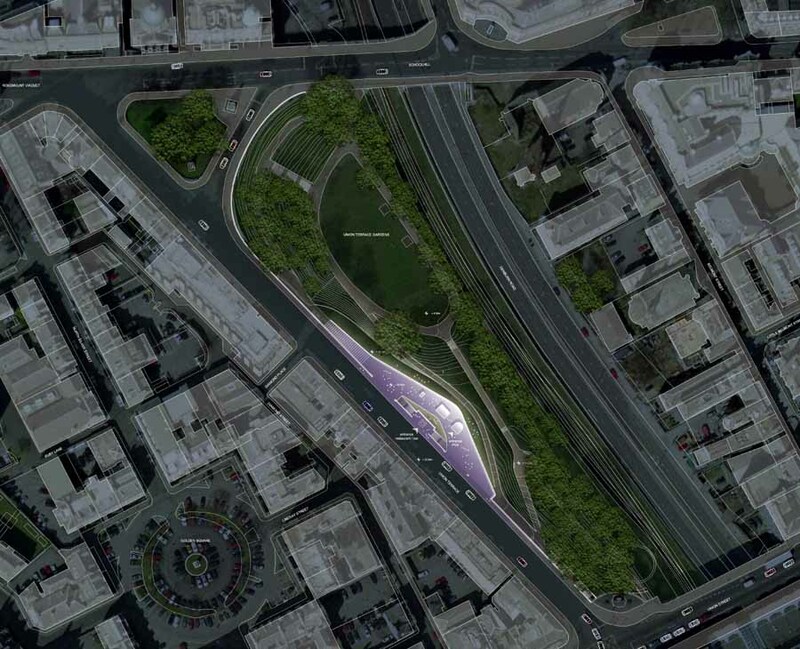 3XN – 3 x Nielsen, Reiach and Hall Architects, Richard Murphy Architects, Nicol Russell Studios. Proposed pavilion in centre of Queensgate would require removal of the Mercat Cross.